Carbon dosing certainly is not a new concept, but it has become more popular in recent years as hobbyist have been learning more about it and seeing some good results. It can be argued that this topic must be researched just as you would any other aspect of the hobby, but I would suggest this would require a little more detailed research as carbon dosing requires a good understand of: maintaining good water chemistry (water parameters), the factors that affect water chemistry, and how to quickly recognize changes in the appearance of your corals and/or the behavior of your fish. I would even go as far as to suggest using this article to guide your further research into this topic before deciding to start carbon dosing. In addition, if your only goal for carbon dosing is to reduce very high levels nitrates and phosphates, then I would suggest carbon dosing may not be for you. In this instance, carbon dosing is only addressing the symptoms of high levels of nitrates and phosphates and not the causes of them. You could still have a problem with your set-up that is just not noticeable now and possible has even been complicated even more. After all, your very high nitrates and phosphates were not caused by a lack of carbon dosing. I’ll try to explain what I have learned about carbon dosing and share some of my experiences with it. I prefer to explain things in layman’s terms as much as possible as I usually just give myself a headache when I try to correctly spell all of the scientific terms or all of the different scientific names of all the different types of bacteria. How Dose Carbon Dosing Work? You are essentially adding a food source (organic carbon) to promote the growth of certain bacteria in your water. As these bacteria grow, they will consume nitrates and phosphates from the water. Once they grow large enough, your skimmer will remove these bacteria along with all of the nitrate and phosphates that was consumed. What are the Benefits of Carbon Dosing? For me, I have a tendency to overfeed my fish which always results in extra nutrients in the water. In addition, I like to run phosphate removers to prevent cyano and nasty algae from being able to develop. Just after cycling my reef tanks, the nitrate levels were around 5ppm, (maybe a little higher) and phosphates were around 0.05ppm. Through carbon dosing at very low levels, I do not have to change my feeding habits and I was recently able to stop using phosphate removers lowering my costs. My phosphates levels now remain very low around 0.03ppm and my nitrates levels will stay just around 1 ppm. In older and more established set-ups, carbon dosing is not recommended, at least not recommended without a lot of carful research first. Older systems that have maintained prolonged higher levels of nutrients in the water will likely have absorbed nutrients into the rock and substrate. This makes determining the correct dosing amount difficult at best. As you start with the recommended dose and increasing it over time according to the instructions, you may not see any impact. The reason being is that as the nutrient level are lowered in the water; more nutrients will leach out of the rocks and substrate to replace it. If you keep increasing your dosing amount until you got a measureable impact, the dosing level could get high enough to cause other problems with your water parameters. In some instances you can promote the grow of other forms of bacteria, such as cyano, or dinoflangellates (commonly thought of as algae) as these types of bacteria can also use the carbon as a food source resulting in their growth in low nutrient environments. It is important to note, there is no recorded cases yet (at least that I was able to find) of carbon dosing leading to the growth of pathogenic bacteria (the bad bacteria that can lead to tank crashes). Carbon dosing can also lower the amount of oxygen in your tank. This will in turn lower your PH and your alkalinity. Both can lead serious and negative effects on all your livestock and corals in extreme cases if you are not closely watching your parameters and react to it quickly. You should always carefully watch your corals for signs of changes and stop dosing should you notice anything and verify the cuase of the change. You should also be aware that carbon dosing in systems that already have lower levels of nitrate and phosphates can potentially cause problems with your water parameters or not produce any of the desired benefits of carbon dosing. You need to carefully research carbon dosing in low nutrient set-ups before you start. What do I Need Before I Start Dosing Carbon? In order for carbon dosing to work, you will need a good skimmer. I always suggest using a skimmer that is rated for close to twice the water volume in your set-up even if you are not carbon dosing. The first reason why you need a skimmer when carbon dosing is that your skimmer will be removing the bacteria, which removes the nutrients they have consumed thus removing the nitrates and phosphates from your set-up. 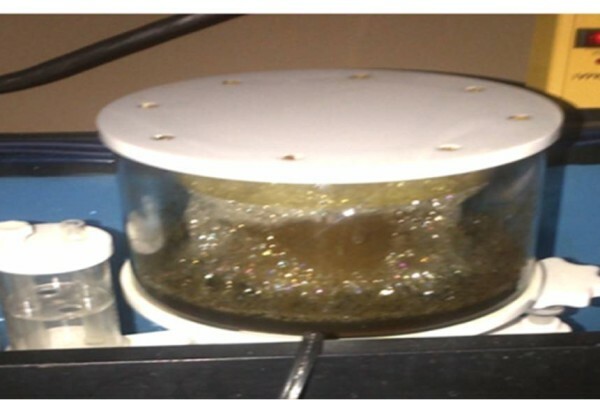 The below two pictures will help show why you will need a skimmer. 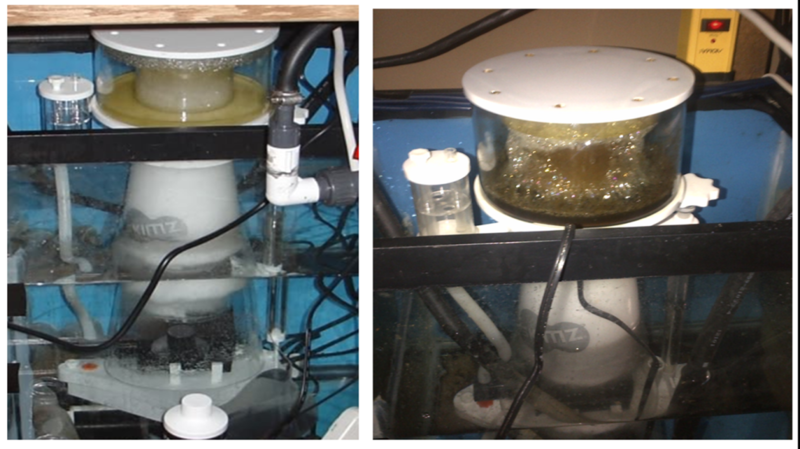 The first picture is taken two days after cleaning my skimmer cup before I started carbon dosing. The second picture was taken two days after cleaning the skimmer cup and 2 weeks after I had started carbon dosing just after cycling the tank. This difference is commonly reported by many hobbyists. You will also need test kits for: Nitrate, Phosphate, PH and Alkalinity. Although this is typically standard equipment already owned by most hobbyists, I thought I would mention it just the same. Note: Using a UV sterilizer or copper based medications will most likely counteract the effects of carbon dosing as they both can reduce the bacteria growth. Also, when using bio-pellets as a source of carbon, you will also need a fluidized media reactor with about 200 to 400 GPH of flow going through it. How do I dose Carbon? This is likely the most popular and most common approach to carbon dosing and one backed by a lot of long term studies and reported firsthand experience. Before you go running to the liquor cabinet and start dosing just any booze in your tank, it is important to note only Vodka can be using as source of carbon. In addition, it must be Vodka without any added flavors. The reason being is that vodka is distilled (not fermented) making it a pure source of ethanol. For detailed Vodka dosing instructions, I would refer you to the below link. I have tried, and had great success following the below information on one of my tanks. This too is another form of dosing which is also backed by a lot of long term studies and reported firsthand experience. Typically, you would only use pure white vinegar for this method. For detailed Vodka dosing instructions, I would refer you to the below link. It contains a vinegar dosing schedule. However, many hobbyists just use the Vodka dosing instructions for Vinegar dosing with great success by multipling the vodka dosing amount by 8. Drawbacks of this method include: easiest approach to overdose with. This is a somewhat newer method for dosing carbon in a marine set-up. This method is said to work best with regular table sugar. Due to few people in the hobby using this method, there are not many long term use studies or firsthand experience to bench-mark off. Many hobbyist stick to using more common sources of organic carbon (such as Vodka and Vinegar) as they feel it is more pure. However, others that have tried sugar dosing have reported very quick results in nutrient reduction and water clarity (after the initial algae bloom that is). The below link contains some different sugar dosing amounts and methods. Benefits of choosing this method include: low cost, easy to obtain anywhere, and some of the quickest results. Drawbacks of this method include: Not long term studies or conclusive or commonly accepted dosing practices developed (or at least ones that are easy to find), and easy to over dose. This is a slightly different approach to carbon dosing. It involves placing the bio-pellets in fluidized media reactor with a flow rate ranging from 200 to 400 GHP depending on the manufacturer’s instructions. The pellets themselves are made of slightly varying types of biodegradable polymers or Polyhydroxyalkanoates (depending on the manufacture). As the pellets break down in the camber, they release a form of carbon which the bacteria consume along with the nutrients in the water. I had started both of my two tanks with bio-pellets. I had great success using it until I experienced a cyano outbreak in only one of my tanks. I fixed this situation by switching to a different method of carbon dosing. You will not always get a cyano outbreak when using bio-pellets. I personally know at least one other person who has been using bio-pellets for almost two years now with no cyano in his set-up. You will have to follow the manufacturer’s dosing instructions that come with the bio-pellets. There are a few different manufactures that have slightly different instructions. The below links will show you two different ones that are available in the market today. Benefits of choosing this method include: the easiest and lowest risk method, better suited method for beginners, and lowest risk of over-dosing. Drawbacks of this method include: the highest cost of all carbon sources, some reported cases of increase cyano also resulting, difficult to control the exact amount of carbon released (could be too low at times), longest time to see results. This is another somewhat newer approach to carbon dosing. This approach is said to have really good effects on reducing nutrients but little impact on the coloring of SPS. Other soft corals such as zoanthids and some types of leather corals will benefit from vitamin C dosing through increased: coloration, growth rates, and regeneration of damaged tissue. Based on what I have read, using a manufactured vitamin C supplement can help reduce the risk of over-dosing and will make the process a little easier. The link below is one example of a vitamin C supplement. The below link will help you figure out dosing levels for your tank. If you are purchasing a vitamin C supplement, I would suggest following either the manufacture’s dosing instructions or the below link (whichever one is lower). I have been using a vitamin C supplement in combination with another form of carbon dosing for a few months now and I am very happy with the results. However, I am using just under ¼ of the recommended dose. I had a noticeable improvement with my zoas and leathers after a few weeks. Drawbacks of this method include: limited impact or longer time to see results, long term studies are hard to come by. Some companies have started manufacturing organic carbon to be used for carbon dosing. The theory behind this is that through including many different types of carbon into one supplement, you will grow a wider range of bacteria types which will increase the effectiveness of the carbon dosing. Currently, there have not been enough scientific studies completed to validate if only one type of carbon dosing will grow only one type of bacteria. Many hobbyists have reported better results combining different types of carbon into one dose. I had switched one of my tanks over to a manufactured carbon supplement in combination with a vitamin C supplement a few months ago. So far I am happy with the results. In my case I am using a much lower dose than what was recommended by the manufacture while still getting the desired results. I’m actually only using about ¼ of the recommended lowest daily dose from the manufacture. My set-ups have always been fairly low nutrient set-ups, so this dosing method allows me to feed higher amount without having to worry about the parameters getting out of whack. Below are just a few examples of the types of manufactured carbon supplements available in the market. Benefits of choosing this method include: Slightly higher costs, contain different sources of organic carbon, second easiest method for people new to the hobby to use. Drawbacks of this method include: limited long term studies, some reported cases of cyano. One addition to the Vodka and Vinegar dosing methods that I have read about is adding a daily dose of bacteria supplements while dosing carbon. These would be the same bacteria supplements that is sold to help cycle a marine tank. The theory is, by using these bacteria additives you are accelerating the growth of the bacteria in the tank which will accelerate the results of carbon dosing. This is also believed to help avoid cayano or dinaoflangellates outbreaks as, in theory at least, the bacteria grown will be able to out-competes the cyano and dinaoflangellates for the carbon, nitrates, and phosphates in the water. Whether or not this will help is a debatable topic and one that should be carefully researched before trying it. One very important thing to remember is that with all forms of carbon dosing, it should take time to see result. Fast changes in your water parameters (even for the better) can be more stressfull than less than idea parameters. If you see quick changes I would suggest to slow things down and cut back on the dosing. Thank you for this wonderful article. I learnt a lot from it. We launched Nualgi Aquarium earlier this year and trialists have generally had good results. However about 2-3% have not had results and 1-2% have had more algae and Cyano. We have taken steps to minimize this by recommending a 25% of recommended dosage to start with and gradually building it up if nothing negative shows up. I would very much appreciate some advise from you so we can refine our instructions further. Please let me know if we can do a call with you. I can help you a little further, however, I would need more specific information about the exact set-up you are talking about. You really have not provided any details such as: a brief description of the set-up, the current water parameters, the make/model of the skimmer, what you are using as a carbon source, how much & how often you are dosing, how long you have been dosing. Increased cyano can be a risk depending on the exact type of carbon being used, however, that can be minimized through dosing a bacteria supplement. If you are seeing a increase in algae growth, then something is wrong. So glad to have found your article. And in a language I can understand. Laymans! I have been vodca dosing for 2 months now. Taking it really slow. My tank is a 65 gallon redsea max. I have really bad algae and it almost killed my coral. Things are slowly returning to a better place and my corals are all improving. And yes, I overfeed my fish! They eat raw clams and black worms. I mispelled vodka. oops! My rocks are leeching phosphates. I can tell which rocks are saturated with phosphate since they still are covered in algae. Since I have began to notice a decrease in algae growth I will continue at my current dose. This has been a slow, but steady process. But slow and steady is best. I did not get here over night either. The lowering of phosphates, and feeding clam juice and tiny particles to my Dendro has brought it back from the brink of death. In my opinion that is. Fascinating and great, easy to understand explanation. I sort of accidentally inherited this tank with very little knowledge to start with about anything at all and I’ve learned quite a lot. It’s in my office and the person who used to maintain it had slacked off and eventually left the area so now its on me. The phosphate level was at 0ppm, while the nitrate level was literally off the chart (100ppm). So high I bought a second brand of test kit to make sure the first one wasn’t a malfunction. It wasn’t. When I “inherited” care of the tank, it had quite a cyano problem and it seemed the high nitrates were a likely culprit. The tank is 65 gal reef tank. I got the cyano under control doing 5 gal water changes every week for two months. I looked like I’d gotten rid of it. However, the nitrate level hadn’t budged at all and I have a purple tang who is losing color and the kenya coral and xenia seem to have faded (the other corals so far seem unaffected). I was advised to try biopellets which I started out with at half the recommended amount and gradually added a bit more. Its been 3.5 months since starting the biopellets. My nitrate levels have BARELY moved and the cyano literally burst out of control over the weekend. When I left the office on Friday, the tank was crystal clear and everything was great. This morning, my entire sandbed was covered in a cyano blanket and its patchy on a number of rocks. I siphoned out the blanket on the sand and will bring in water to start waterchanging tomorrow — but none of this fixes the underlying problem. I’ve already cut the light down to 6 hours a day (back when the cyano first became a problem) and have cut down on feeding so I don’t believe there is much that isn’t being eaten. I’ve got 6 narssius snails (no clue if i spelled that right) and a herd of blue legged and red legged hermit crabs. There is a skimmer, though I fear it may be small for the tank, but the sump in the cabinet under the tank is apparently odd and this skimmer was the only one that could be found that fit — all the rest require at least 12 inches of water to sit in and the sump isn’t that deep. SO – Your post notes that carbon dosing can cause cyano to grow – would you suggest that I keep on with the pellets and siphoning out the cyano and it will eventually level out and the cyano will go away? Or should I stop with the pellets and do….any recommendations? I’m dosing vinegar right now and it works to lower nitrate and phosphate… I use do add NOPOX and my nitrate wasn’t going down as vinegar. But im just wondering if i still dose vinegar(daily) is it dangerous to lose some corals? I would like to ask you about vodka dosing. I already dose my tank with vodka. I have been dosed it for 6 days then I test the phosphate it’s reduce to 0 but I wonder why my tank still have hair alge. Your hair algae you be consuming the phosphates as soon as they are produced, much like how the bacteria will consume the ammonia product by fish waste almost instantly resulting in no ammonia being registered on your test results. I would guess this is what is going on here. Even more if you tank is less than a year old and/or you had high levels of phosphates in the past. Thanks for the great explanation!! It was very helpful!!! I’m testing sugar dose one coffe spoon a day for three months now in a 200 liters aquarium no skimmer!!! So far so good but i have good oxygenation in my thank!!! Well thanks again was so good to read post!